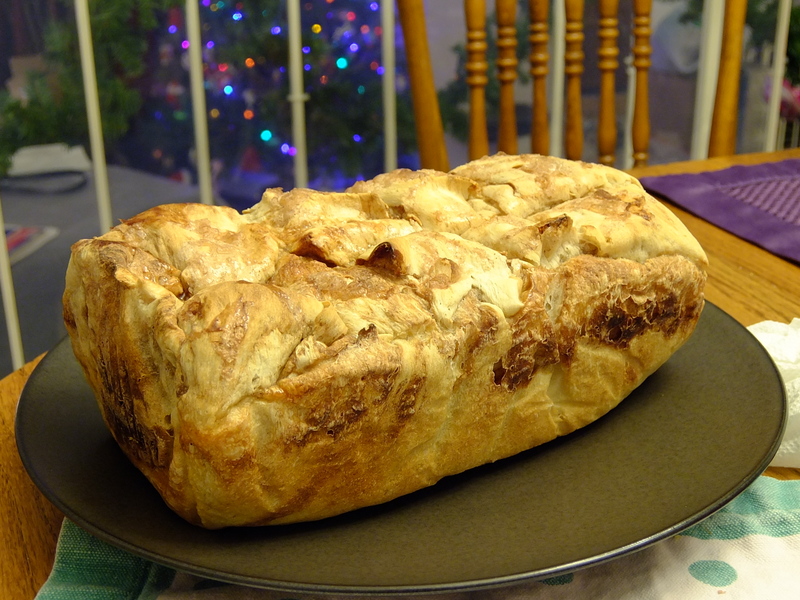 Jill from PianissAmma has graciously bestowed upon us a recipe for bread that will impress even the pickiest in-laws this year. About two years ago, my sister in law brought her sourdough starter with her to Los Angeles. She was kind enough to offer me some of her dough, which I cultivated and made dozens of loaves of bread from. Baking bread is a specialty of mine, but baking sourdough was new to me. I was excited, because I wanted a chance to make vegan breads all on my own. Sourdough starter utilizes three ingredients: water, flour, and wild yeast. On my baking journey, I bought lots of bread books, browsed many a website, and found that many sourdoughs incorporate butter, eggs, milk, and not so wild yeast. I eventually found dairy and egg free recipes, but I have yet to get my wild yeast to work completely on its own. It’s okay though, because I have cultivated some fabulous bread anyway. Today, I give two recipes for your enjoyment. Two loaves in one oven. One savory, the other just slightly sweet. The savory goes well with olive oil and vinegar, or butter, if you like. The sweet? Have it with almond butter. It’s sweet, but not too sweet, and great for breakfast too! This recipe makes two loaves of bread. I generally make one loaf sweet, the other savory. 1) Combine yeast, sugar, and 1 cup of water. Stir, then let sit for five minutes. This allows the yeast to activate. 2) In a large mixing bowl, add starter, two cups of flour, salt, and mix. Add the yeast mixture, and then add the remaining water and three cups of flour slowly. If using an electric mixer, be sure to use your dough hook. Mix until the dough is smooth and slightly sticky to the touch. If kneading by hand, knead until the dough is smooth. 3) Cover dough, and allow the dough to rise. It should double in size within 60 to 90 minutes. For faster rising, set the bowl in a clean basin and fill the basin with hot water. 4) After your dough has doubled, divide your dough in half. Set aside one half of your dough. Place the other onto a lightly floured cutting board. If you do not wish to season your bread, skip ahead to step 6. 5a) For savory bread, flatten the dough until it appears to look like a very thick pizza crust. Sprinkle on 2-3 tablespoons of fresh minced rosemary. 5b) For sweet cinnamon bread, flatten the dough until it appears to look like a very thick pizza crust. Coat the top with a thin layer of cinnamon. Glaze your surface with the 2/3 of the sugar solution. (To create the solution, combine the ingredients, and heat gently until sugar is dissolved and water slightly thickened). 6) Roll the bread up into a loaf, and place in a greased bread pan. If you do not desire a greased pan, simply nest on parchment paper, then set in the bread pan. Cover, and let sit for about 1 hour, until puffy. Drizzle with water. Take a serrated knife, and make slashes along the middle of the loaf. (Savory variation): For your savory loaf, sprinkle kosher sea salt on top. You may also garnish with more rosemary. (Sweet variation): Drizzle the remaining cinnamon/sugar solution over the slashed area. 7) Bake at 425° F for 25-27 minutes. Remove, and place on a cooling rack. Nice recipe.Thanks for sharing here. I would include that unexpected synthesis is a happiness to the eye' as well; that is the reason we have each one of the styles and outline . The custom papers are not exchange as pre on paper cheap essay writing services management organizations they supply their clients with just quality papers. You may really carry up a play for him or her, or in the event that you may most probable buy an at this point written and distributed have around with that isn't very required for reading. Jingle Bells! Cutest video ever. Ask a Teacher: How Do You Feel About Homework?